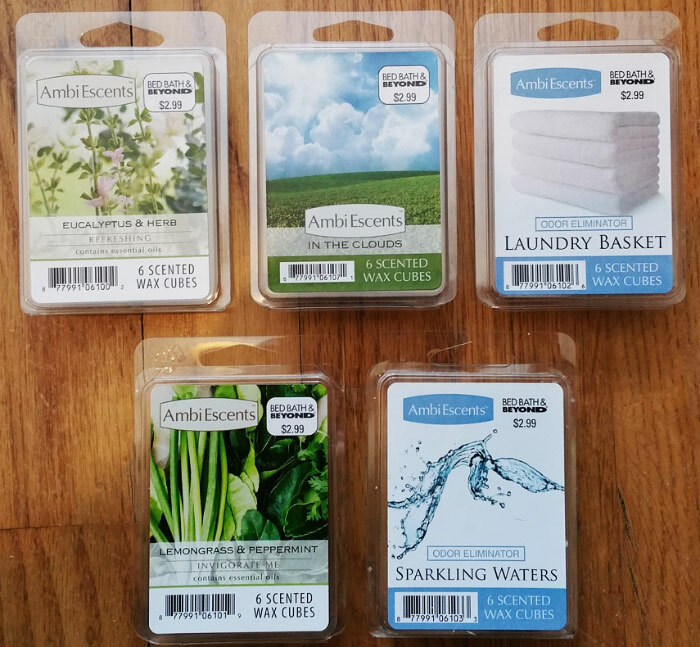 Read reviews of AmbiEscents Wax Melts from Bed Bath & Beyond (Spring 2017). Other stores besides Bed Bath & Beyond might carry AmbiEscents wax melts, but I've only found them at BBB. This is pure menthol eucalyptus. It smells a lot like Vicks Vaporub, but not as pungent. There may also be some pure mint in the background, and this is not a sweet scent at all. I don't detect herbs, although the mint might be the herbal note. This one has a strong sinus clearing effect from close up, although not really from far away. It's a good one to melt when you have a cold or allergies due to its sinus clearing effect, although it would be best to put the warmer close to the bed or couch to get the maximum effect. This is the same scent as ScentSationals Day Dream scent. It's a nice green plant type floral, not overly sweet like a flowery floral, but more like sweet green grass with a little bit of jasmine wafting in the air. It also has a hint of spicy perfume, just enough to make it "not quite" a floral, but somewhere between a floral and a perfume. A fantastic soapy lemongrass scent with a mint note. This is a relaxing spa scent, and the mint is subtle. It's not a sweet peppermint, nor is it spearmint (no "toothpaste" notes), but more of a fresh "natural" mint. This scent is similar to the old ScentSationals Sparkling Herbs scent, but with more lemongrass. And it's nothing like ScentSationals Zen, or the new ScentSationals Serenity Spa. This one says "Odor Eliminator" on the label. It's light on cold sniff. It smells like a combination of a laundry scent and a fresh air scent. It's not a biting laundry scent like Better Homes & Gardens Line Dried Linen, and it's different from the new AmbiEscents Laundry Basket scent above. That scent is more sweet and bright, whereas this one is more neutral, like towels that were cleaned a few days ago but still have that slight laundry scent. It's a subtle scent.